← Does the California driving license need to be harder to obtain? 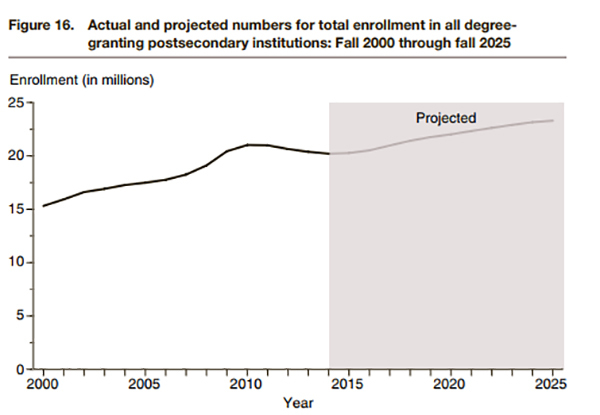 Feds: College enrollment to grow 15% by 2025. LOL! Government predictions are always a hoot. I remember the government predicting how the USSR would grow and grow and grow and become ever more powerful…and those predictions came out every month, right up until the USSR collapsed because it was simply too weak to continue functioning. It was clear afterwards that the USSR had been withering, dying, for decades. Anyone with eyeballs could go to the USSR and see those predictions were absolute rubbish, and yet we continuously expanded our military to match their “growing” threat. Similarly, our government is hysterically bad at making predictions for our own economy; every stock market crash is a complete surprise to all those very highly paid economists with supposedly great skill at predicting such things. Partly why these ridiculously terrible predictions go wrong is the government makes wildly unrealistic assumptions; for example, predicting a million jobs will magically appear in the next few months. They do this every year, but for some reason some people still pay attention to this idiocy. It is, of course, the same when predicting the weather, with forecasts clearly more about politics than reality. It’s nuts that a 3 day forecast for a hurricane’s path has a 1,000 mile cone of possible routes, but we’re supposed to accept the government’s 100 year temperature forecast for the planet as accurate within 0.5 of a degree. Turning over to higher ed, making enrollment predictions for the country should be easy enough that even the government can do it. I mean, college enrollments have been dropping for 5 straight years. That’s not a prediction, that’s a statement of fact, an observation of a clear trend. When considering how many college age students we’ll have in 2025, it’s a prediction, but not much of one. For example, to be 18 in 2025, you’ll need to be 10 years old in 2017—getting 8 years older over the course of 8 years is a pretty safe prediction. The demographics are perfectly clear: we simply won’t have as many college age citizens in 2025 as we have today. So, we have an established downward trend of enrollment, and a demographic wall that should further exacerbate the trend. A legitimate government report would predict further falling enrollment, and that’s not even factoring in current issues like race riots, Leftist riots, skyrocketing student debt, and a population which, honestly, is beginning to realize a college degree really isn’t worth anything near what’s being charged for it. 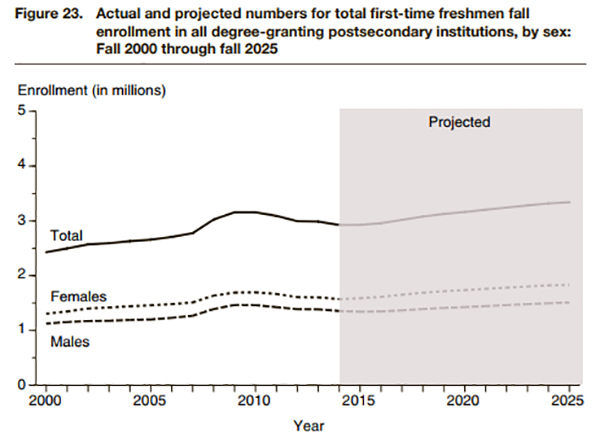 Seriously, I’m hard pressed to think of anything that would indicate college enrollments will be up in 8 years. If they’re the same in 2025 as today, that’d be a miracle. You’d have to squint to read the chart precisely, but there’s minimal growth in the grades 9-12 line in the 2017-2025 range, and it’s right around the 16 million mark. With no growth in college age students, it’s tough to believe there’ll be growth in college students. 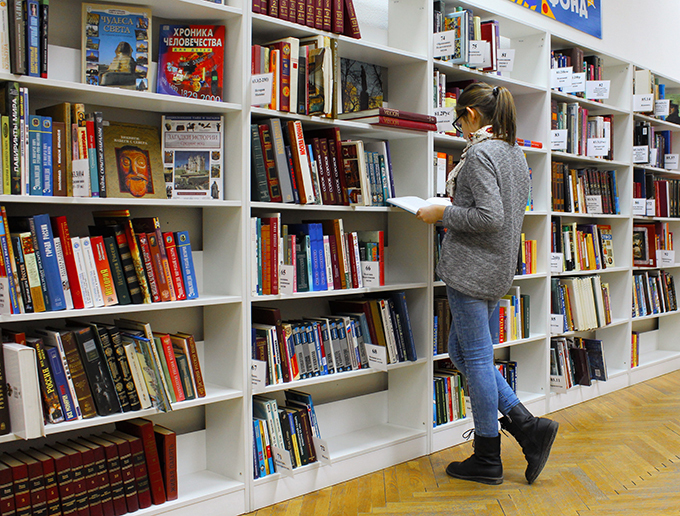 It agrees that enrollments have been dropping the last few years of their data. 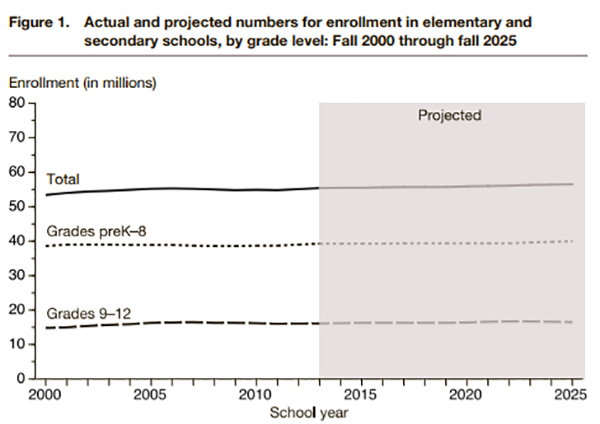 Laughably, the report is already invalid, as it’s “prediction” for the years 2014-2017 doesn’t match the reality of enrollments continuing to drop; it says we’d have around 20 million students today, unlike the reality of around 18 million. How do you justify the idiocy of projecting growth here? The government knows our higher education system is dropping fast from the world stage, from first to eleventh. This is a trend that has no reason to change anytime soon. We’re not going to get growth from the rest of the world sending their best and brightest here. Much like with all other data we have, one would expect enrollment from this source to drop. The main claim of the report justifying the bizarre prediction of growth is that we’re going to start having much older students (25 and up) in college, magically. The 25 year olds in 2035 are around 17 today…if they’re smart enough not to go to college next year, they’re smart enough not to go in 8 years. They won’t be dumber in 8 years, after all. –an army recruiter acquaintance told me he has a conversation like this pretty much every week. College administrators have lowered standards to the point that people not intelligent enough for the Army can still easily get into college. Honest, the words “exploitation” and “predatory” apply when discussing college administrators. College graduate IQ is dropping to below 100 because they’re exploiting the most vulnerable now. Look, it’s one thing to sucker a kid right out of high school into signing up for $100,000 of debt…they don’t know any better, and our ruthless administrators in higher ed have exploited them all they can. Our predatory community college system actually targets kids from families with no college experience, because those are the most vulnerable to being suckered into going to fake colleges (there’s nobody in the family to warn them, after all). An 18 year old is easy to trick, but 25? At this stage, the “student” probably has a child or two, and has likely been taking care of himself in the real world for a few years. He’s going to know about the internet as a ready source of knowledge, and know just how viciously exploitative our higher education system has been…this might not be completely common knowledge today, but this information should be very common knowledge by 2025 (unless Google can bury it). I just don’t see growth happening, not without incredible changes to how our higher education system is run, changes that aren’t even being remotely discussed today, much less planned to be implemented by 2025. I’ve spent a lifetime in higher ed, so trust me: you can’t completely overhaul this system in under 8 years. For good reason, it was designed for such to be impossible. It took decades of control by a corrupt administrative caste to get it at this point, it’ll take at least a decade to get it back to being mostly respectable…and even then there still wouldn’t be a bunch of 25 year olds clamoring to get in. Just look at that steady growth of first time freshmen! Both males and females, even though it’s well known males are fleeing our masculinity-loathing colleges. But this same report has already told me that we won’t have growth in our high schools, our primary source of freshmen…where oh where could that growth come from? Now comes the insidious aspect to this report. Across the country, for decades, our institutions of higher education have been on insane building sprees, erecting palace after palace to our self-proclaimed titans of industry, the administrative caste. “Hey, it’s not our fault, we had a government report predicting steady growth.” Then they’ll cry all the way to the bank.